Ultrasound devices have come a long way since they were first used in the 1950s. One thing that has not changed is their value. Ultrasound machines allow us to see images that examine the body’s internal organs more closely and are incremental to many medical processes today. These adaptive technologies are essential for medical professionals to correctly diagnose their patients on a regular basis. This year, we are seeing emerging trends in their application. The ultrasound machine industry is progressively evolving, as is the technology behind the science. These trends are critical in paving the way for the future of ultrasound technology. A few of these trends include advancements in the integration of AI, newer methods of visualization and an increase in more effective one-on-one patient connections. These trends reside at the forefront of the evolution in ultrasound equipment, and will ultimately lead to better patient care overall. In this article, we’ll dig into the latest technology for 2019 and how these trends will impact the future of the ultrasound machine industry. 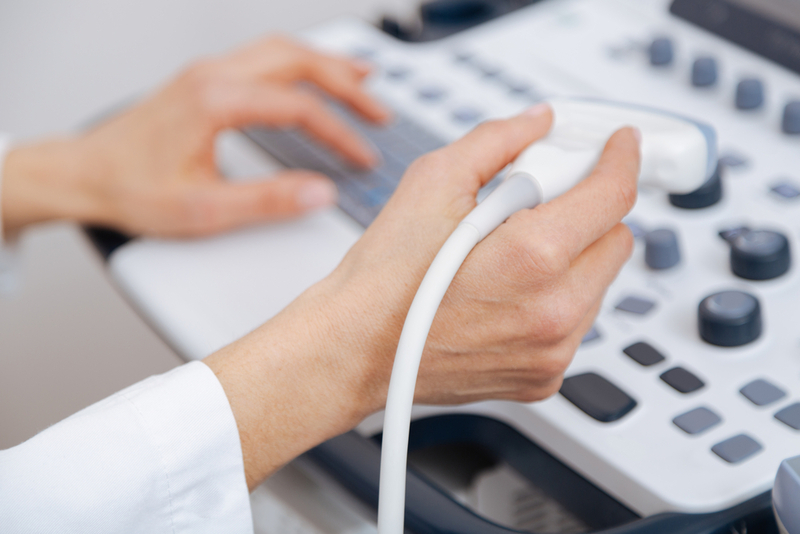 Ultrasound machines are invaluable tools used for relatively quick and simple investigations and diagnosis. However, most standard ultrasound machines are too large or too expensive for clinics to realistically have easy access to whenever it is needed. These factors make the point-of-care ultrasound (POCUS) a smart solution in both general practice and emergency situations. Most pocket-sized ultrasound machines tend to weigh between 5 and 8 pounds for a fast and accurate read that can be taken wherever needed. With imaging technology that is both satisfactory and timely, these machines can be extremely vital in assessing patient needs in a situation where time is of the essence. In the same amount of time that it might take to set up a standard-sized machine, the pocket-sized ultrasound may already have an accurate reading for the next steps that can expedite patient care. The Vscan from GE healthcare is a useful tool able to inspect a wide range of areas including the heart and abdominal organs and can aid in pediatric and OB/GYN practices. This pocket-sized probe is versatile, with the ability to provide color-coded blood flow and black-and-white anatomic images quickly and easily. It may be a small piece of equipment, but the pocket-sized ultrasound machine is making a big impact. For example, the military now uses them in the field to assess injuries. Medics can use these ultrasound devices to identify internal injuries, especially when a wounded soldier is unable to identify his or her source of pain. It’s beneficial in the field for pinpointing any internal bleeding within the abdomen or chest and determining the best route to take for treatment. In the office, more and more doctors are using pocket-sized ultrasound machines as a more effective way of identifying health issues. The future of healthcare is largely powered by artificial intelligence. By leveraging AI, we can deliver a more precise and efficient patient experience. Automation streamlines workflows by handling time-consuming tasks, such as choosing the optimal image from a 3-D dataset. There are many ultrasound machines that incorporate AI at some level right now. For example, Philips’ Epiq system leverages anatomical intelligence. In the scanning field, AI can automatically identify segment and color code the anatomy. Additionally, it can pull the ideal image for many different exams. This saves an extraordinary amount of time to focus on the diagnosis and the patient rather than sorting through images. The Konica Minolta Sonimage HS1 has been recently introduced to the market, targeting musculoskeletal interventional procedures. It incorporates AI-voice recognition for hands-free functionality. Through simple voice commands, you can multi-task, holding a syringe or needle in one hand and the transducer in the other. AI has also made its way to the pocket-sized ultrasound. GE Healthcare enhanced the DiA Imaging Analysis AI-fueled LVivo EF for automated ejection fraction (EF) measurements. LVivo EF offers a solution to having EF interpretation being conducted at the point of care level through visual estimation. With LVivo EF, clinicians receive left ventricle EF scoring and volume measurements with AI technology and progressive algorithms. Bay Labs’ AI-based EchoGPS ultrasound guidance software is also burgeoning in the cardio realm. Northwestern Medicine is initiating a SHAPE (Seeing the Heart with AI Powered Echo) study to assess the software and its ability to diagnose specific kinds of heart disease in the primary care environment, among patients 65 and older. With this technology, certified medical assistants (CMAs) will be able to secure high-grade echocardiograms, even without scanning experience. This innovation shows significant promise in bringing echocardiograms to the primary care setting. 3D ultrasounds provide clarity by utilizing sound waves to create a three-dimensional image. In the past, the focus was on improving post-processing image resolution. Now, manufacturers are focusing on increasing frame rates, high-quality resolutions and improving color Doppler. These advancements can reduce misdiagnoses by allowing medical professionals to provide timely, effective treatments for their patients. For example, a cardiologist utilizes the 3D imaging for an aerial view to assess the heart prior to surgery. These updated processes offer new ways to reconstruct images and speed up evaluations. In every area of medical practice, doctors are working toward finding new ways to improve upon more effective methods of treatment, better patient connections, and efficiency of diagnosis and courses of action. Ultrasound machines are constantly evolving, adapting to the cutting-edge technology and demands for efficiency today. Be sure that you have the ultrasound machine you need to keep your practice running smoothly. If you have questions about your current ultrasound machine, give the  National Ultrasound team a call at (888-976-7880) today.